Shopbop launched their newest sale yesterday, which includes some of my favorite pieces...plus it's a tired sale so the more you buy the more you save-win, win up to 25% off with code BIGEVENT16. This is one of my favorite sales because designer items that are normally $$$ are included in the sale so you can save big if you've been waiting to buy that cute Rebecca Minkoff bag or Sam Edelman pumps you've had your eye one! I threw together my favorites from the sale below, I'm loving all the pastels and bright colors, perfect for spring! Aren't they though? I'm just loving the color!! 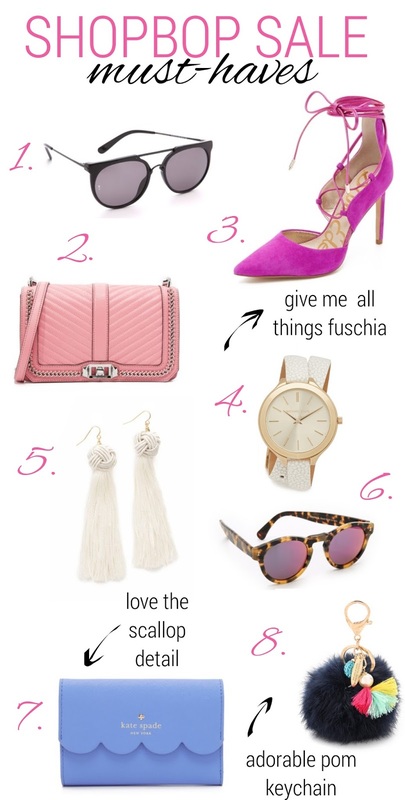 I've been loving all things fuschia lately, too!